We visited New Mexico last month and so enjoyed our visit in lovely Taos, set against hills covered with golden aspen. As usual, we stayed at the Taos Inn, an elegant but comfortable compound of adobe buildings. 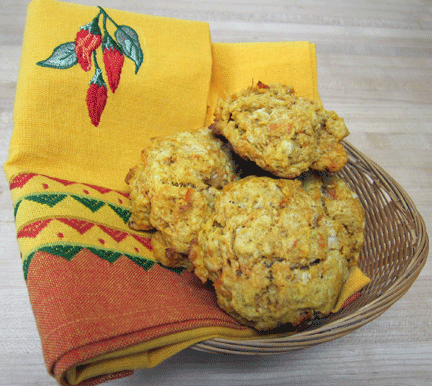 We like to eat at the Inn’s restaurant, Doc Martin’s, and enjoyed these yam biscuits with our huevos rancheros for breakfast one chilly morning. Our waiter was kind enough to give me the recipe and I was eager to bake off a batch once we settled in at home after our autumn vacation. I played with the ingredients just a bit, adding some brown sugar and spices. The ice cream scoop makes “free form” biscuits that are easily prepared for baking. These might be a nice addition to our Thanksgiving celebration – or yours! 2. Sift dry ingredients together in a medium-sized bowl and transfer to mixer. 3. Add the cubed, cold butter and mix on low speed, using the paddle attachment, until the butter is the size of small peas. 4. Add the milk and mashed yams and mix until just combined. Expect to have small pieces of yam in your batter. They add color and fit with the rustic recipe. 5. Using a standard-sized ice cream scoop, measure out the biscuits onto a large sheet pan, lined with parchment paper. 6. Bake until biscuit centers are firm, 25-30 minutes. Hey Liz! So pleased to see this recipe…I am wanting to try these myself. Thanks so much for posting! Liz, these sound delicious…bring some up with you! I cannot wait to get to SF! We will have a lot of laughs, no doubt! These sound great. Brown sugar and ginger sounds great. I may make these for dinner tomorrow with pork chops. Have you ever used fresh ginger? That is all I may have, but either way I will let you know. Let me know how the fresh ginger works! These sound just wonderful, and I love your idea of adding the sugar and spices. I love the idea of a yam biscuit! Perfect for the Thanksgiving table! Let me know if you try them – enjoy the holiday, coming up way too fast!